Sharp has planned all its future-generation digital signage and interactive solutions around their Sharp Open Architecture Platform, which includes the Mini Open Pluggable Specification (Mini OPS) standard. 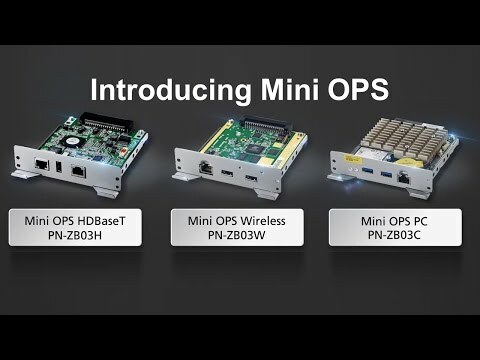 The Mini OPS development offers customers a wide range of compact, energy-efficient choices to enhance the way they receive, manage and distribute their display content. The PN-ZB03PC is a powerful single-board PC built into the Mini OPS form factor. Thanks to its powerful, compact, high quality solid state design, it is the ideal choice for demanding continuous use situations. And, being solid state, it runs quietly and reliably thanks to its fanless design. If you need simple, tidy, cable-free PC integration with your Sharp display, the PN-ZB03PC is the perfect match. Its powerful graphics chipset supports up to 4K ultra-high definition video output at 30Hz, and further functional flexibility with 2x USB3.0 interfaces. It is Microsoft Windows 10 ready, and comes pre-installed with Sharp’s most important applications. Fanless design: Increases reliability and reduces moving parts, even in the smallest of systems. Small footprint: Supports new form factor solutions, at almost half the size of conventional OPS dimensions. Innovation roadmap: Offers the performance and advantages of the latest low-power, cost-effective Intel® processors. New pluggable connectors: Supports high-speed transmission, such as 4K displays with stunning images. Energy-efficient: Reduce energy costs with low-power, green solutions. The open architecture approach of Sharp’s Mini OPS supports flexible application design: it is ideal for integration into displays, while simplifying digital signage installation, usage, maintenance, and upgrades. Because the architecture is modular, any costs associated with the display chassis upgrade or redesign are eliminated, along with the usual cables (power, display, HDMI, VGA) associated with a visual solution. Modularity also provides a competitive advantage for future proofing technology investments - media players and screens can be upgraded independently. Solutions based on the Mini OPS provide ease of use combined with cost savings; media player integration means no cables or external power supply are needed. Low power consumption translates into low electricity bills for systems deployed with Mini OPS, reducing operational cost. Many retail stores have their digital content server, or PC, in a separate, cooled room at the back of the premises. But if it’s any more than 10 metres from the display, standard video cabling simply won’t work. The Mini-OPS HDBaseT module gets around the challenge of sending video signals over long distances. In an emergency services control rooms setting, the Mini-OPS Wireless module can streamline the flow of information at vitally important times. Data in the form of photos or video on an operator’s mobile phone can be quickly shared to a wider group with mounted display units featuring the wireless module. Decisions on the right next steps can be collectively made with minimal delay. In a busy, high-intensity environment such as an airport or shopping mall, time and space are finite resources, but information distribution is critical. The PN-ZB03PC Mini OPS PC is robust and reliable, quiet and energy-efficient - built to work in demanding settings where the constant provision of accurate and consistent information is vital. In a boardroom or meeting room, having easy and effective BYOD screen sharing is an essential element in nearly all modern team collaboration, training and presentation situations. The PN-ZB03W wireless collaboration board can be neatly fitted to compatible Sharp’s BIG PADs and provides a very flexible and powerful interactive display solution.